On May 8 this year, Cpl. Darrel Usher was charged with wounding upon Christine Neal, a teacher who was at a wake when he allegedly attacked her. According to police, Neal reported that on April 25, she was at the wake for Mark McKoy in Hattieville when she was stunned by a punch to the left temple and a kick to her stomach — the unprovoked actions of Usher. 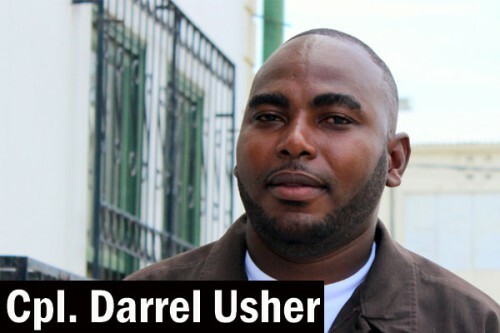 Usher pleaded not guilty to the charge when he appeared before Chief Magistrate Ann Marie Smith, and was offered bail of $1,000 and one surety of the same amount, which he was able to meet. This morning, when he appeared in court, the prosecutor informed the court that Neal had gotten in touch with him and related to him that she didn’t wish to pursue the matter criminally. With that, Usher was informed that his charge had been dismissed and he was free to leave the court. Usher’s father, Gilroy Usher, Sr., still faces a harm charge for allegedly attacking his wife, Magdalena, with a bottle. His case was adjourned for September 25, 2013.